Downscaling 6000 meters of riser length to ‘laboratory scale’ still leaves one with quite a large test setup. 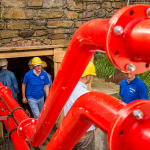 Such is the experience of the scientists and engineers from TU Bergakademie Freiberg and Royal IHC, who are building a vertical hydraulic transport test setup in Lichtloch VIII, a mineshaft near Freiberg. Development of the test setup is part of the Blue Mining project, an EU funded research and development project which aims at increasing the technology level for future deep sea mining. The test setup will consist of a 55 kW centrifugal pump, a separation plant and a fully instrumented flowloop of 291 meters in total. The vertical riser of the test setup will be 136 meters long. This might seem small from a deep sea mining perspective, but it allows the research team to study the vertical hydraulic transport process in great detail on a much larger scale than possible thus far. The system will be transporting sand and gravel, mimicking the transport of manganese nodules. The measurements will allow validation of the calculation tools developed earlier in Blue Mining. The experiments are planned to start in May 2017. At date, the preparations are running at full speed. IHC Mining in The Netherlands is developing a separation and injection plant, which will be used to insert sediments into the system and empty the system after each test. At IHC MTI, the test program and measurement systems are developed. The first steelwork will soon be put together, and the sensors are already waiting for installation. More than 700 km to the East of the Netherlands, scientists at the TU Bergakademie Freiberg are busy preparing the mineshaft with all necessary equipment. The pipework is chosen, carefully dimensioned and it will be installed by a team of professionals. August 26th a special progress meeting was organized at the TU Freiberg, which started with an exciting tour through the old mineshafts below the city of Freiberg. Scientist Mr. Toni Mueller knows his way around both in and below Freiberg, and he entertained the group with his wide knowledge of the history of the city and its mines. Next year, we will continue making history at this fascinating location.